The Fullerton Arboretum in Fullerton, Calif., is hosting a new exhibit featuring Dr. Susumu “Sus” Ito’s World War II images at the Orange County Agricultural and Nikkei Heritage Museum from Sept. 10-Oct. 29. In addition, on Sept. 17 from 1-3 p.m., Lily Anne Y. Welty Tamai will give a keynote talk for the opening reception of this exhibit. Tamai interviewed Ito before his death in 2015 at the age of 96. She went on to publish an article about him and this exhibit in the Southern California Quarterly, a Historical Society of Southern California journal. Ito’s World War II photographs document his tour of duty through Europe as a member of the celebrated all-Japanese American 442nd Regimental Combat Team’s 522nd Field Artillery Battalion. 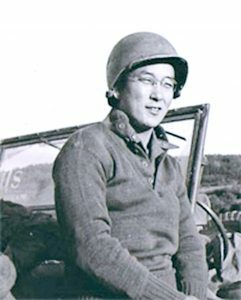 While Ito participated in the rescue of the Lost Battalion and the liberation of a subcamp of Dachau, his photographs, taken with a prohibited camera, capture the humble daily lives of young Japanese American soldiers serving in the segregated unit. Many of the photos show his fellow soldiers posing next to their jeeps, walking in the snow, swimming in a river, playing chess and even visiting tourist destinations while on leave. Ito went to great depths to preserve the negatives, carrying his photos nearly 5,000 miles across Europe and having his film developed at villages along the way. Unseen for decades, these images provide a fresh and personal look into the soldiers’ lives. In the years following the war, Ito studied biology with the help of the G.I. Bill and later received his PhD in biology and embryology. He joined the faculty of Harvard Medical School in 1960 and eventually served as the James Stillman Professor of Comparative Anatomy Emeritus from 1991 until his death. No tickets or reservations are needed for the Sept. 17 presentation, but seating is limited. The exhibition is open Sundays, Wednesdays and Saturdays from Noon-4 p.m.
For more information, call (657) 278-4010 or visit http://fullertonarboretum.org/museum_nikkei_current.php.